Coldwater, MI: Nothing compliments a set of FOX coilovers like a quality suspension to maximize travel. BDS Suspension is excited to announce new heavy duty upper control arms (UCA) now available for the 2007-2017 Toyota Tundra trucks. These new UCAs are designed for improved strength, great looks, and more wheel travel on leveled and lifted for the Tundra. Take your Tundra to the next level of ride quality and performance with suspension upgrades from BDS. Indexed ball joint cup allows for additional droop travel. Heavy duty MOOG ball joints. Full assembled, ready to install. Designed for 2-3" lifts and compatible with many full IFS lift kits. Can be used with BDS 3" and 7" kits, not recommended with BDS 4.5" kit or Zone 5" kits. I just installed a set of bds 4.5” lift kit with Fox coilovers on my 2015 Toyota Tundra 4×4, and right now I wanna upgrade the ucas for my tundra, but I just see here this set uca not recommended with the 4.5” lift kit, so what kind uca will recommend with 4.5” lift kit? Uniball style uca or balljoint style uca? Or do you have any other plan to upgrade a set of heavy duty ucas for my tundra? Hey Kay, congrats on your new 4.5″ coilover system, be sure to send in some offroad/off-pavement shots of the truck so we can get it featured on social media (email photos/specs to marketing-bds@sporttruckusainc.com). On you question about UCAs the arms, ours are designed with an indexed ball joint cup to correct ball joint positioning on trucks with a leveling kit installed or any other lift kit that causes the ball joints to operate at more of an angle. 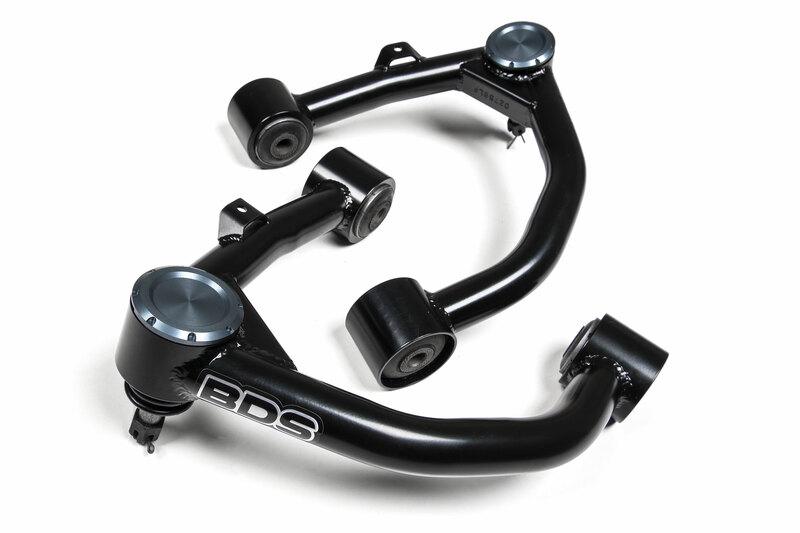 Our 4.5″ kit is designed to correct suspension geometry back to stock operating angles which is why we don’t recommend using our UCAs on there however they are compatible with our 7″ system. While both styles have their benefits, personally like ball joint style UCAs over uniball as they offer better corrosion resistance if you live in an area that salt and other abrasive chemicals on the road in the wintertime along with being easy to service. The factory arms are plenty strong, but if you’re looking to swap them out you’ll need to find a set that is compatible with a stock height truck to match your current suspension geometry. Hey everyone.. I have 2017 Tundra with the 7 inch BDS Lift kit. 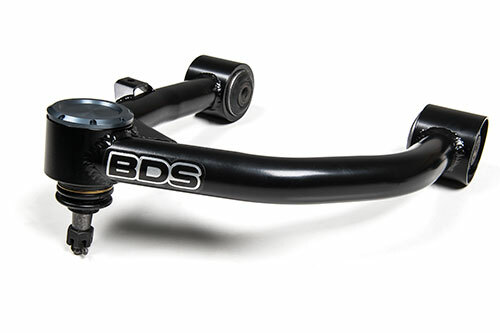 I’m looking to buy the new BDS UCA’s but I’ve been hearing that aftermarket UCA’s don’t align well with the BDS Lift kits.. I’ve heard I need a Heim Joint UCA … have you heard this as well?? And if so, will this new BDS UCA work fine for alignment with my lift?? Hi Jay, thanks for reaching out and your interest in our UCAs. These UCAs are designed to work with our 7” lift system (as well as most other lift/leveling kits on the market) to correct ball joint positioning and increase wheel travel. 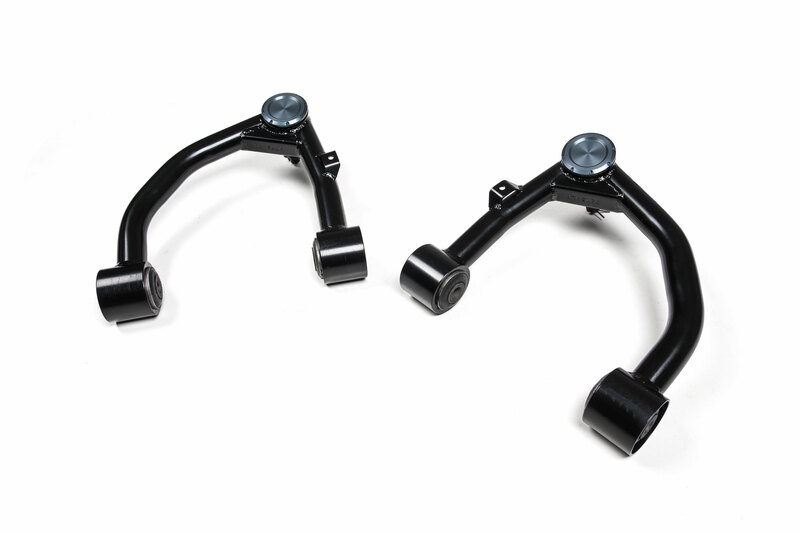 You won’t have any issue re-aligning your front end with these arms installed. The key benefit to the balljoint/rubber bushings over unibazl/heims is increased durability and corrosion resistance along with quiet operation. Will these work on 2018 crewmax limited? These UCAs are compatible with 2018 model Toyota Tundra as well. Will these uca’s fix the alignment issues I’m currently having with my bds 7″ coilover lift? Hi Kyle, you shouldn’t be having any alignment issues with our 7″ system assuming the kit hasn’t been modified. 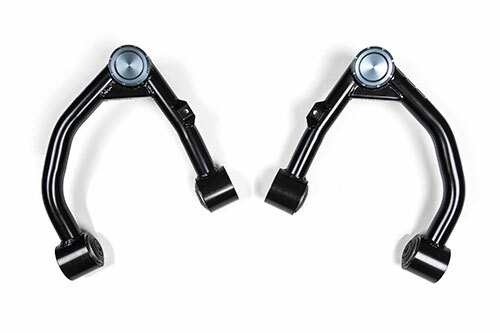 These UCAs will improve ball joint positioning over the stock UCAs, but your truck should be able to be aligned with stock or aftermarket UCAs. On you alignment issues I’d recommend contacting our customer service/tech support team so they can get help get to the bottom of what’s going on or head to your local BDS distributor. Hey guys just installed the 2.5-7″ extra Reservoir BDS/Fox shocks on my 6″Rough Country lift brought it to have it aligned and they say they couldn’t align it right I plan on getting a second opinion but will these uca’s work with my Rough Country lift? While we haven’t tested these for compatibility with the RC lift kit, they are a bolt-in OE replacement designed to be used on applications where the stock UCA rides at an increased operating angle to correct ball joint positioning. The taper of the ball joint is the same as stock so I’d assume these would install without any issues on your current setup. Also – I’ve contacted the distributor and they are not willing to resolve the issue. This is causing a lot of headaches and very stressful with the outside wear on the tires as they aren’t cheap. Hi I have a 2013 tundra on a bds 7″ lift was looking to get a little more out of it. Soni wanted to throw a bds 2 inch spacer on top of the fox 2.5 coil and add these upper arms . Do you think I’ll have issues with angles or any issues at all ? in a nutshell we don’t recommend modifying our 7″ kit for the Tundra to sit any taller than it comes right out of the box. In general we don’t recommend modifying any of our kits outside of how our engineers designed them to be used, especially with IFS and in the case of the Tundra the change in suspension/steering geometry could lead to alignment issues, effect handling and lead to premature wear of front end components. Our 4.5″ and 7″ kits use the same base components to lift with the 4.5″ kit repositioning everything to operate at similar to factory operating angles whereas the 7″ is like having a leveling kit installed. These UCAs will improve strength and ball joint operating angle from the stock units, but the steering angles and CV angles will be maxed if going taller. The most common option for Tundra customers looking to go taller is to add a body lift, other options for additional tire clearance are fiberglass fenders and an aftermarket bumper. Can you use these on a 8” ready lift kit? Hello, I plan on doing the BDS/Fox 3” coilover system as I don’t care for the 7” sky high lifts and all the problems that come with lifting a vehicle that high. How close to stock will the bds UCA get? Do you have the +/- caster specs? I think stock is around 2*-2.5* am I correct? Trying to learn more about UCA’s in general. I’ve heard stock arms are fine with 3” of lift, but I’d like to go aftermarket just for more wheel travel and tire clearance. I’m currently on the fence about your BDS UCA and the MCM Fab UCA. Any insight would be great. The upper Control arm looks amazing as it’s protected agenst the dust for offroading but do you have for Fj cruiser? Or the tandra will fit? Hi Salman, thanks for your message. At this point we haven’t released the FJ Cruiser/4Runner specific UCA kits, but they are in the works. Keep an eye out for upcoming product releases. Is it true tha BDS is certified by Toyota to not void the warranty on a Toyota vehicle? I want to level my 2018 trd 4×4 SR5 but don’t want to void the platinum warranty I have.